Wiley‘s role as the godafather of grime is clearly one he relishes. Having created the genre and paved the way for the likes of Dizzee Rascal, Roll Deep and countless others, you might not blame him for resting on his reputational laurels. Instead, his latest LP sees him in more philosophical, reflective mood than ever, attempting to spread his knowledge on to the next generation of artits. Being the godfather in the more traditional, rather than gangster sense of the word, you might say. As the album title suggests, he’s made as many mistakes as scored victories along the way, so although he’ll big himself up at times – which grime MC doesn’t – at others his lyrics have a vulnerability and humanity that’s missing among his contemporaries. While he manages to maintain the tough, street themes you’d expect from the genre, the viewpoint is invariably more mature and considered than the grime stereoptype suggests. There are warning to younger MCs not to blaze through their cash and end uop flipping burgers for a living (on ‘Step 21’). Where others brag about their fame, Wiley tells us “at the top it’s lonely.” There’s even a meditation on the challenges of parenthood, ‘What’s On Ya MInd’, that manages to be heartfelt and thought provoking without being sickly and sentimental. Musically, the basic framework of grime , those most skeletal of beats, blips and bass, are very much in evidence, but come embellished with some some suyrprisingly lush textures at times. The spiralling ambient guitars of ‘What’s On Ya Mind’; and the claustrophobic synth swirls of the title track are particular signs of him spreading his wings production-wise, evidently enjoying the freedom to be adventurous and fresh. Likewise, the appearance of US rapper Cam’ron on ‘Lonely’, a spectacular and gloriously rowdy posse cut which keeps threatening to die away but keeps coming back for more, is an unexpected and envigorating change from the usual exclusively East London (or therabouts) tones. All in all, while there’s no chart-threatening anthem like ‘Wearing My Rolex’ here, the subtle progression in Wiley’s sound will probably win him new fans without alientating any of his fiercely loyal long term supporters. 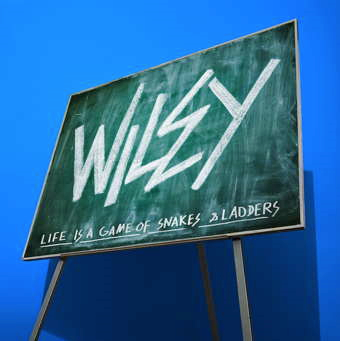 If life’s a game of ‘Snakes and Ladders’, then Wiley seems to be throwing all the right dice at the moment.